We have put together some helpful information for you to use in estimating your project needs, to assist you with design options and ideas, and general tidbits you might find useful. Please select from the PDF’s to the right. The color and type of mortar joint used will greatly affect the overall appearance of your masonry project. Different types of joints can be achieved using a variety of jointing tools. Examples of joint types include; Concave, Grapevine, V-Joint, Convex, Beaded, Weathered, Recessed, Struck and Flush. Another factor that affects the overall look of stonework is how tight or wide a joint is. In addition, the color of mortar used to fill the joints between the stone or brick will have an impact on the final appearance. 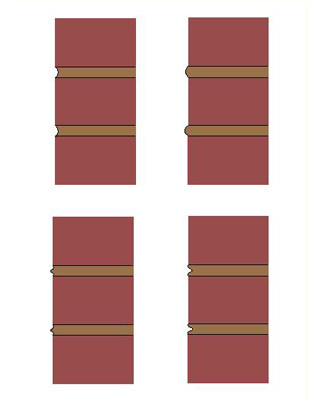 The PDF above shows examples of different joint types and the effect of joint color.